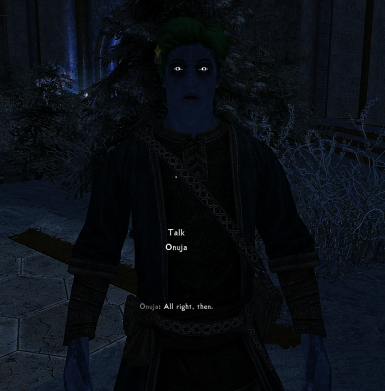 Just informing that if you have the Shiva Vanilla Head Replacer mod you have to open with the others mods in the CK and generate the facegens for all npcs of the mod (not only khajiit and argonians) that you are making the patch or you will have the darkface bug. I just wanna say thank you for taking the workload from me lol I stopped modding a while ago due to some life complications and seeing someone else doing these patches makes me happy! Keep up the good work. I also use Shiva's Vanilla Hair Replacer, is this the same process for making patches? I read your instructions, but at the part about changing the hair, eyes, etc, you don't have to do that manually with Shiva's replacer. Is this a different process or are the steps you posted just lost in translation a little? I believe Shiva's essentially replaces the vanilla assets themselves, then regenerates the facegens to have the new hairs. The part about changing hairs, eyes, etc is mainly to ensure the Argonians or Khajiits don't have floating horns, are bald due to missing hair, and what nots. It should basically be the same process as patching new npcs to use new assets just like what is said on the Vanilla Hair Replacer's pinned posts. So far my patches only use the KS hairdos already defined in the Fluff esps. Unless the hair replacer also affects the vanilla hairs for Argonians and Khajiits then there would be no need to change hairs at least. The rest, however, may probably need a change. I get a weird error in MO2 with the M'rissi patch -- it says I'm missing masters, Specifically, that I need Apachii Sky Hair (.esm plus male and female) plus Imperious. Nice, patch for Immersive Wenches too, please? Thanks. SAME thats my #1 issue with it atm. Will be up in an hour or so. Thanks :) I also had some eye pop out issues dont remeber what it was. Ill get back to you when I know. EDIT: First one found Appearntly Madesi from USSEP? Dont know if thats vanilla or why. Sounds like a slight conflict with another mod that touches Madesi. I only touch (or at least try to unless CK decides to pull its shenanigans) NPCs from other mods since as far as I've seen, the original Fluff mods (patches and all) cover all vanilla beast folk. I also use USSEP and have seen no problems with Madesi. Hm. Dunno. I checked xedit and as far as it's aware only Vanilla+USSEP touch Madessi. hm.. Also the base page for fluffhjit has an "eye" floating fix. But it never did anything. Fluff's Hybrid Argonian M'rissi Patch has CRF in masters, is this required to work or mistake? Hi. Please can you make patch for Inigo? Could we get a patch for Mrissi - A Tail of Troubles? Mrissi herself is a mixed Khajiit-based race but could use a serious overhaul nonetheless alongside the Khajiit in that mod. A patch for Moonpath to Elsweyr would be nice too. I believe Beyond Reach may have a Khajiit or two. Thanks. Edit - Interesting NPCs has some Khajiits in it & could use a patch as time allows. M'rissi patches up. After checking her in CK I would need to do a bit more than simple slider movement since as you say she is a separate race and thus gets no benefits from Fluff stuff. This could be a good starting goal to break into actual npc creation or customization with all the fun assets lying around. If I do get to it I may put it as a mod on its own page as I would like to keep this page for the NPCs that do use the vanilla races. I still have Interesting NPCs lying on my drive unopened for some reason. I guess now is a good time as ever. Thank you! Forgot to mention Falskaar as well. Some of the bandits in that mod are Khajiit too. There may be a few Argonian bandits as well. At any rate, I seriously hope to see a major Mrissi overhaul from you at some point. She needs a serious overhaul IMHO.